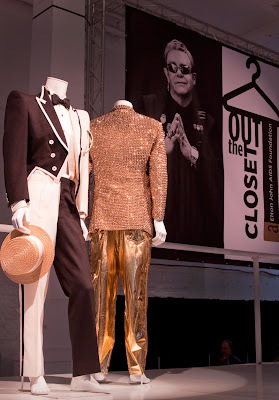 Want to grab yourself something out of the closet of Elton John and David Furnish's wardrobe? Then make your way to "out the closet" Russell Street in Covent Garden and be quick. Clothes, shoes, and accessories all are up for grabs from as little as £10 -Versace, Dior, Prada, McQueen, D&G & Jean Paul Gaultier. Not only do you get yourself a bit of stardom, you also help a worthy cause. All the proceeds from this pop-up store go to support the Elton John Aids Foundation. Clever poster and a great way to merchandise a cause that will help many people. What a wardrobe! Did you take a look?? I wonder where I could wear gold metallic pants like that? My wife wouldn't let me out the front door! Great photo - rock on! So did you buy anything? Oh, how I wish I was there to see this. What fun and for such a good cause. I hope they have some EJ music playing while you shop. My wardrobe has been crying out for a pair of metallic orange trousers! lol! All for a good cause though.